This 40-acre property is surrounded by National Forest Service and State Lands with a buildingsite that has alreday been developed! This is an extremely rare opportunity own property with good access and only 1000 feet from the scenic Painted Rocks. It’s hard to find land for sale in the West Fork of the Bitterroot in the first place because there isn’t much private land to begin with. The West Fork is covered with National Forest lands to hunt, hike, and enjoy. It may be hard to find land here but it’s even harder to find land surrounded by National Forest and State Land. You’ll have only about a 600 foot driveway from a year round paved State Highway there’s power, phone, and even garbage service along this highway, so this property offers year round living with some winter plowing. Just across the highway is Painted Rocks Lake and Painted Rocks State Park with a boat ramp. The amount of recreating you can do from this property is nothing short of phenomenal. There are six fish species found in the lake, including west slope cutthroat trout, rainbow trout, brown trout, brook trout, dolly varden, and native bull trout. Painted Rocks is a scenic lake that received its name from the green, yellow and orange lichen that cover the grey and black rock walls of the granite and rhyolite cliffs around the lake. You’ll find some of these lichens on the rocks along the ridgeline right on the property too. Draining out of the lake is the West Fork of the Bitterroot which is well-known as a Blue Ribbon trout fishery. You can hunt and hike right out your back door on the tens of thousands of acres of the Bitterroot National Forest that surround you. There are hundreds of miles of roads you can drive and ATV on and there’s access to the remote high country of Idaho as well, you’re close enough to Idaho to hunt both Montana and Idaho. 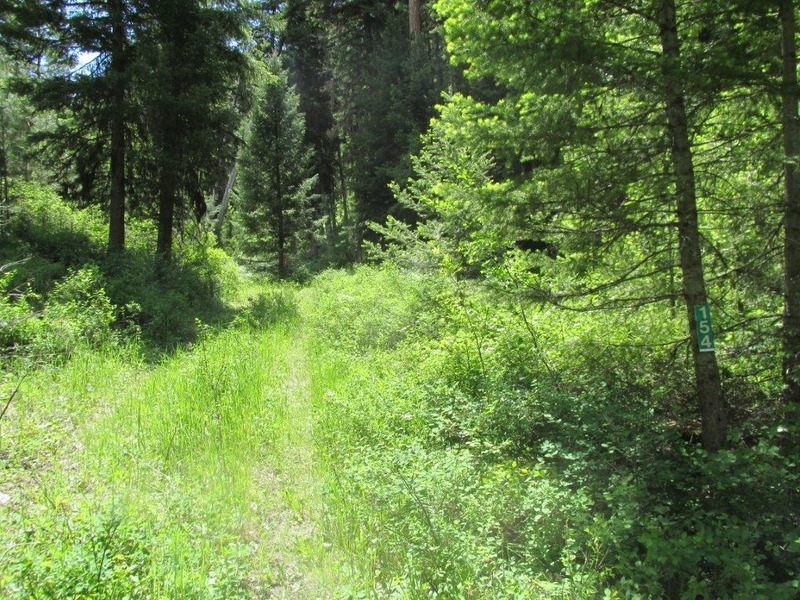 The property is within ½ hour drive of two wilderness areas. Nowhere in the Lower 48 States provide a wilderness experience to match the sheer magnitude of the Frank Church-River of No Return Wilderness area in Idaho, the largest contiguous unit of the National Wilderness Preservation System in the Lower 48, and the Selway-Bitterroot Wilderness in Montana is the third largest Wilderness in the Lower 48. The Magruder Corridor, a motorized access road, can be driven to access these wilderness areas; it’s a narrow-motorized corridor that separates the two. The park-like tree and grass covered slopes of the property have old growth Ponderosa pine and Douglas fir scattered across them. There is elk and deer sign everywhere on this property and antler rubbed trees to show they rut here during hunting season as well. The Painted Rocks area has bighorn sheep and peregrine falcons too. Due to the location and its uniqueness, and being priced at lonely $138,000 this property will likely sell quickly. If it’s what you’ve always dreamed of don’t delay, you can’t go wrong with this one. Call Scott Joyner today at 406-223-6039, to learn more about this one of a kind property.